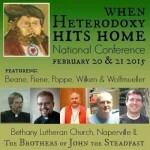 Home→2015BJSConference→What can you expect in Naperville in February? What can you expect in Naperville in February? Snow? Maybe, though I hope not as I will be traveling by land from Wyoming. But seriously, why is the BJS conference worth attending. There are no shortage of great conferences out there (ACELC, ACL, CCA, Symposia…) so what is going to be good about BJS this year? Food. The folks at Bethany, Naperville put on some great food. Usually there is some sort of theme that is put on (a few years ago it was Chicago-style pizza; a year before that it was WMLT colored treats). Apart from food, there are the folks who attend who provide great table conversation as well. Faith. That is the Faith that is believed (fides quae) being taught and talked about. This year promises to be our best year of speakers yet. Each speaker touching on how they deal with the heterodoxy and combat it as well as giving help and encouragement to the rest of us that deal with it. We have the voices of a lot of internet Lutheranism coming to speak on a topic that is very timely. These men of God will be a blessing to those who attend. They are also known to be men who keep to the sound pattern of words that they have received, rather than entrepe-manuring words to mean almost anything other than what they originally meant. They are men who will speak of faithful practices based upon the teaching once delivered to the saints, not the faddish “best stuff” of the ever-changing world around them. News. There will also be a number of BJS authors attending the conference this year, so this will be a chance to meet them in person as well. A BJS Update is planned as well as the Conference allows us to let you know of some of the things we have cooking. Good News. There will also be opportunity to hear the Word of God in prayer offices and also in a Divine Service. Topic. This conference will be addressing a topic which everyone sees but no one seems to want to talk about (THE elephant in the room). The “diversity” of things allowed under the four-letter acronym is getting larger. More and more is allowed under the title “faithful Gospel ministry”. While many seem content to let this slide continue, there have been faithful men and women, pastors and congregations which have adopted ways of dealing with it. Prizes? Yes. This year we are assembling some prizes for those who register early. More on that to come in the future. Fighting? Yes. We have invited both Randy Asburry and Eric Anderson to be present as the co-hosts of Steadfast Throwdown. They will be doing some various things – perhaps a little skirmish could be arranged between the hosts to promote the show. Surprises. Yep. There will even be some surprises to come yet. A few things are in the works which will be announced at the conference. A few of these surprises will be going on at the conference itself. Merchandise. What would a conference be without some vendors? Vendors are welcome to check with Bethany about advertising and selling stuff at the conference. There are already a couple very good ones lined up. Its a good way to save some shipping if you are already there. February in Naperville is worth it for these and other reasons which are yet to be announced. Please please PLEASE make this available in an audio format for those of us “second-tier Christians” who cannot make it!!!! 😀 We will be happy to pay in dollars, scotch, and Doctor Who DVD box sets! Can I sign up and attend as a non-Lutheran (not partaking in any communion service, of course)? I’d be interested in hearing some of the speakers. George. You absolutely can register and come. Skilfully identify effective organizational models.